Add a touch of antique charm to your home with the? 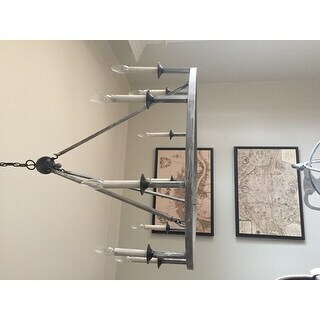 ?Old World 9-light Chandelier. 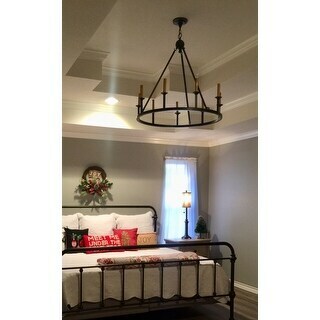 This chandelier features an old world design with a metal construction, black finish and 9 candle-style lights.?? This fixture needs to be hard wired. Professional installation is recommended. Love this chandelier! We just bought an old southern home that had brass fixtures throughout (yuk!). I wanted a chandelier that looked as if it could have been the original but with a modern touch. This chandelier is PERFECT! The black is modern day yet the style is rustic and old world. 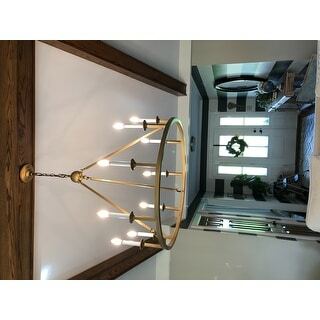 We have a deep foyer and not very wide with the stairs right at the door and this chandelier looks amazing in it and lets off plenty of light (25 watt bulbs). We have elliptical transoms over the front door and dining room entrance and thought the round chandelier would look great. Couldn't be happier! You see similar chandlers on tv home shows, on Pinterest and in magazines right now. It's such a design trend! I didnt want to spend big bucks to get it. 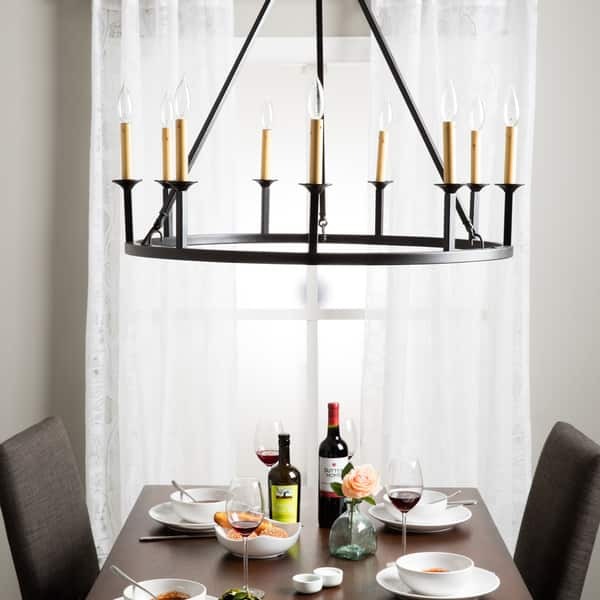 Size: It is a large chandelier and can hang as high or as low as you want by cutting the chain that comes with it. My room is 18'x 16' with 10' ceiling. It helps draw the eye up. Color: the finish is one solid color of very dark brown/ black. It goes well with my oil rubbed bronze items although it is darker. The candles are yellow not white. Price: great price, value and quality seems very good. I've had it for 2 weeks. Installation: it comes almost put together in a very large box. I had it professionally installed because of the high ceilings which cost $90 more. I wanted something large over our formal dining table and I was nervous ordering online. I went back and forth on lighting and this one stood out to me! It seems big and dramatic and it is! Look beautiful over my dining table, perfect touch! It does scratch easily so be careful when installing. Was not hard to install. Looks great in my flip! Arrived exactly as pictured. 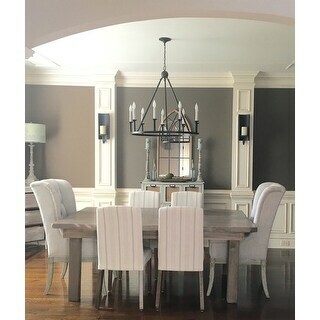 It is a large chandelier, but still fit in well in this smaller dining room. I'm a designer, and illustrator, and was looking for an inexpensive copy of what I had seen in several magazines that I liked. One similar light seen in a Connecticut beach home. This is a perfect close match, beautiful, rich, simple, not too modern, not too traditional, but, if it had to, could go either way and light to hang. It is open, and doesn't take anything away from whatever else you add to the room, just enhances everything. One of those. Mine is over a 48 inch round table in front of an arched window that looks onto a lake. Didn't want a light that would obstruct the view. No problem with this. I installed a dimmer, and MAGIC! I do have a high ceiling, but not too. There is nothing about this I don't like. At the holidays, I am looking forward to hanging ropes of faux red berries, that will drape nicely from the wide, flat, circular body. I have designed for casinos, one named after a sunken lost city, among many other things, and I am so happy to have found this. Why pay more, spend the money saved on a super faucet! Or a trip to the casino! Enjoy! 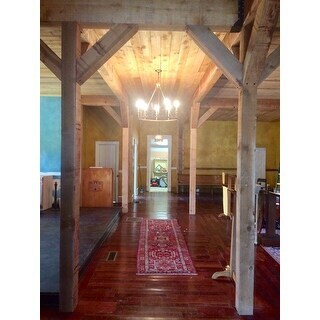 Love This 9 light Old World Chandelier. Arrived On Time and Packaged Well. Easy to install. This is a great ligjht fixture! Arrived just a few days after I ordered it. The box it comes in is so large I was afraid it might be too big to hang over the 60" round table in the eating area in our kitchen. But it isn't..it looks great. Very simple, and does not take take up a lot of "visual space", which is exactly what I wanted. This replaced a more modern looking fixture that had six mini snow glass shades around a big snow glass bowl...the metal parts were wrapped with a leaf- type adornment...it was just too fussy for the look in our more "old world" kitchen. This is much easier on the eye when taking in the whole room. It belnds with our decor. It's a heavy fixture and seems to be pretty well made. No problems with any parts of the fixture. It appears that one could put mini shades on the fixture to dress it up a bit since it uses the candle bulbs. I am very pleased with it..it's definitely not something you will see everywhere. 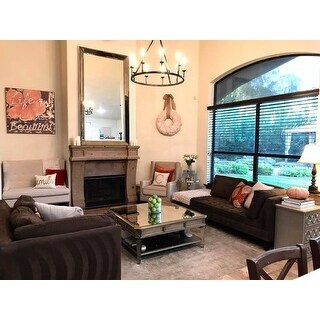 The style could blend with many different decor styles and in various rooms. I am very pleased with my purchase! Good looking but has minor flaws. As an interior designer, I can be very picky. This is a really good looking fixture however the finish does flake easily if you are not careful. Also, mine does not hang perfectly straight. It is not too obvious and probably no one can see it but me, but I wish it were perfect. By the time the light was hung in our new home, it would have been quite an ordeal to have it taken down to be replaced, so we left it up. It is a very unique piece and looks quite nice hanging over my 60" round table in the dining room. 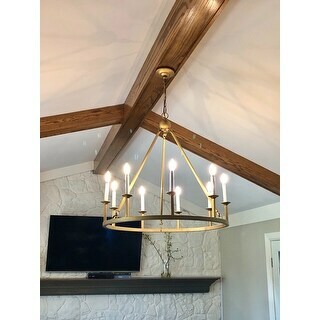 Instead of the overdone chandelier that you might expect to see there, it has a very simple elegance and doesn't steal thunder from the other items in the room. If it hung perfectly straight and the finish were perfect, I would have given it 5 stars. 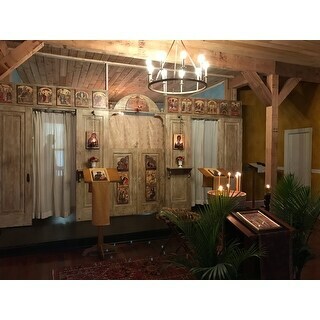 I bought this light fixture to use in our Orthodox Christian church, and it is perfect! I needed something large in scale, and this is the perfect size. Black didn't go with our colour scheme, so I painted it a soft metallic bronze with gold accents, and it is beautiful, Installation was a snap, with no problems at all. Could not be happier with this. The name describes it perfectly. Love this chandelier. Perfect "old look." I wanted a wood chandelier, but the round wood variety cost upwards of 1000.00. I ended up faux painting this one and love the result! This chandelier is gorgeous! I was inspired by a multi-million dollar home that had similar chandeliers. So I ordered 2 of these to replace our old chandeliers. They are so fresh and simple - they add just the right touch of style to the space. We love them! They were easy for the electrician to install. 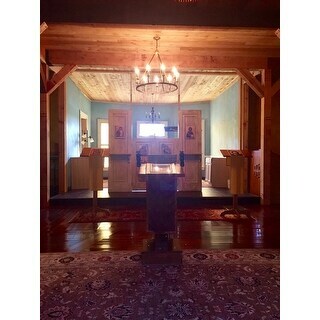 It came with plenty of chain (and our ceilings are 14 feet high where they were installed) . Simple and elegant. 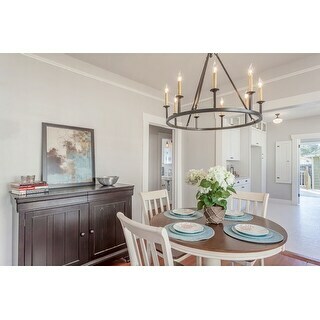 I had been searching for similar light fixture for a while and finally came across this one on overstock.com. I hesitantly placed the order and hoped it would look as good as it does on the picture. Well, let me say ...when I received it and opened the box I was ecstatic! It’s surpassed any of my expectations!!! I am truly a happy customer!!! Great price for a beautiful chandelier with a timeless design. I chalk painted the candle sleeves and distressed with charcoal wax. Exactly what I wanted. 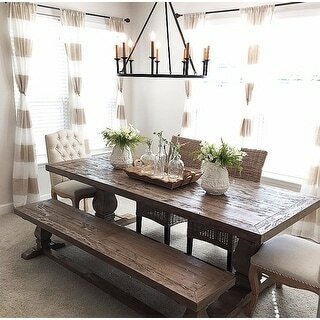 This is just the classic look that was needed for my dining room. Wanting to update without being too trendy. The quality is nice and it looks like a quality light. Nothing cheap about it. Light looks great and shipped quickly. I did paint the covers black like many others. Loved it! fit our space perfectly. The only thing I would have changed is the ball apparatus at the top of the arms holding the whole thing. I feel like it just doesn't quite match the rest of the light. I got over my pickyness and it is a really nice looking light, especially for the cost. We used it in the dining room and it was a bit tricky to find bulbs - we had wanted LED but some look a little weird and our light hangs low so we had to do some searching. We tested out regular 25 watt bulbs and decided those were still a little too dim for what we wanted, so the LED allows you to get a higher watt rating (brighter light) but still stay in the safe zone as far as energy that it is using. This light also shines up and illuminates the ceiling, so that was a change for us because our other light shown down to illuminate the table. Fantastic. Looks beautiful. Very large. Great piece. Looks very expensive! Perfect for my stairs! I ordered black and I love it. It is very large needs to be in a larger area. I have a traditional house but would look good in a modern or organic natural home also. It’s perfect. I gave mine a little makeover with some spray paint and gold rub n buff and it’s gorgeous. Cannot best the sale price. This chandelier is BIG! If you are looking for a statement piece that is large in size and simple on details, this is the ticket. We hung this above a 54” round dining room table, and it is exactly what we wanted. I also purchased the Lisbon ceiling medallion and the Royal Designs gray cord & chain cover. These two accent pieces were just the right amount of fancy detail to highlight the simple, but large, design of this chandelier. The price is tough to beat too. 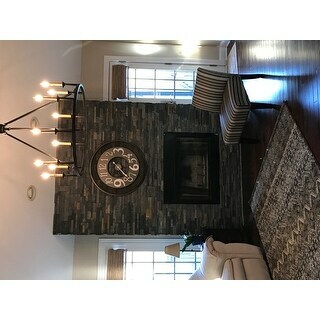 Purchased for our breakfast area and we have gotten several compliments on it. Love! Just what I've been looking for at a great price! Thought I'd paint the candles like other posts had mentioned but now that it's here I like the way the candles look. "Can this be used with ceilings that are 8' tall?" "What are the dimensions of the part of the light that attaches to the ceiling?" "Someone else asked if this light is dimmable, but Overstock answered with "it should". That doesn't seem like a clear cut answer. I would like to know before I buy it if it is dimmable or not? Thank you!" Yes it is. We built a new home and had the electrician put in a dimmer switch for it. Itâs very nice. Yes, we installed a dimmer switch and this chandelier looks beautiful in any light! "What is the minimum hanging height for this fixture?" "Is this fixture ok for sloped celings?" Yes, you can hang this on a vaulted ceiling. we have it on a sloped ceiling---no problem. Yes, we bought 2 for use in a room with sloped ceiling and they look great. "Hi, how much is the weight?" "Could you use this outside in desert climate protected covered area?" This is not recommended for outdoor use. we live in a dry climate and have it on a covered terrace---no problem.